I knew something was wrong as I turned the corner around the copse of black walnut trees where mourning doves roosted. The stillness of the gray-breasted birds perched in a dull slash on a tree limb contrasted with the clamorous buzzing of thousands of bees. As though readying for battle, their thundering racket was an alarm that meant danger to anyone or anything that chanced upon them in their harried state. As a mother knows the meaning of her baby’s whimpering, so a beekeeper understands the droning of her bees. I thought an animal might have disturbed them––a raccoon, or maybe a deer, had kicked over a hive. That alone would cause them to be anxious and make it difficult for me to work with them. I hurried past the vigilant doves, their heads swiveling in my direction. Coming around a hedge of honeysuckle, I encountered a six-foot-high wall of enraged bees hovering between their white hives and me, a glittering wave of golden insects ready to inflict painful stings on anything deemed hostile. Thank goodness I had worn my thick white cotton bee suit as honeybees hurled themselves at my veil in a panic. To be accosted this aggressively is unnerving, even for the most experienced beekeeper. I felt my stomach muscles tighten. Talk about a gut feeling. “Babies, babies,” I cooed. “Settle down. Settle down.” Then I saw the source of their fear and revulsion. The metal cover from the most populous beehive had been heedlessly thrown on the ground, and wooden rectangle frames full of baby brood lay abandoned next to it. Thousands of young nurse bees frantically tried to protect this nursery full of eggs and wax-capped unborn bees by covering the frames with their bodies. This violation alone would make honeybees angry, but I saw that someone was bent over and plunged face down into the open hive, which made them even wilder. The person’s arms hung down outside the hive. I noticed the fists were clenched. “What are you doing?” I yelled, startled at the sight of a strange person with his head and shoulders inside one of my hives. “Who are you? Get away from there!” I stepped back, waiting for a response. My chest tightened. Hoping to stave off an asthma attack, I reached in my pocket for my albuterol spray, but realized my veil would stop me from getting the medicine to my mouth. I breathed more slowly and inhaled the musky odor of the bees along with the heavy, cloying scent of honeysuckle hedges behind their hives. Somewhere in the distance I heard the growl of a tractor cutting sweet hay. I flinched at the sudden piercing call of a redwing blackbird. I scanned the field for further danger. Other than a person sticking his naked head into one of my hives with eighty thousand bees dive-bombing him and me, nothing appeared different. The rest of the hives waited in line like sailors standing at attention in their white uniforms. Bullets of reflected light darted back and forth from openings in the bottom hive boxes so quickly the human eye could barely register the tiny insects. Freshly mowed grass manicured the ground around the hives. Their water tank, full of hyacinths and duckweed, stood unmolested. The intruder did not stir. Grasping a fallen branch from the ground along with my belching hive smoker thrust before me, I moved closer. “Mister.” I cried, “MISTER!” I assumed it was a he––a heavy-set man with pale skin wearing tan corduroy pants and laced-up boots. My initial shock overcome, I realized he didn’t seem to be breathing. Not a good sign. The bees covered him, pulling and biting at his neck, stinging his scalp and his back, furiously trying to evict him from their home. I inched closer. He looked stiff. I poked him with my branch. He didn’t shift. I jabbed him again with the tree branch. Nothing. Leaning over the body, I carefully swatted away the bees. “Girls, girls, don’t sting him. It’s over. Don’t waste yourselves,” I whispered. The bees stung him still and, by doing so, condemned themselves to death too. The man’s neck swelled against his checkered shirt. I took off my glove to feel for a pulse, but the bees swamped my hand, stinging furiously. I pulled away quickly. “Merde!” I exclaimed. I cradled my badly stung hand. I walked away from the hives, yanking off my beekeeper’s hat and veil. I fumbled in my suit for my cell phone. My hands were shaking as I dialed 911. “Police? You better come. I have a dead man in my beehive. Yes, that is correct. 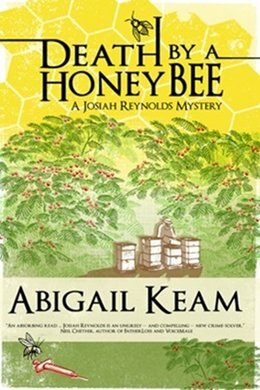 He is lying face down in a beehive.” I gave the police my name and address, clicked the phone shut, and sat on the meadow grass waiting for the wail of the police siren. It seemed like a long time before they came.